Found this in the 50 cent bin of a local thrift store recently. Sleeveless, but still in okay condition. Here´s all the information that I could find about this mysterious, completely forgotten group. – Bert Landers was a Berlin band leader who recorded a great number of records for various German labels, but mainly for the budget Tip. He also recorded under the name of Berth von Landers und sein High Society Orchester. I assume that The Bertlanders-Starband is actually the studio orchestra of Bert Landers in one of its earliest formations. – Trumpeter Heinz Wulfestieg (1936–1977) was a half-brother of actress Hildegard Knef. – Alto-Saxophonist Dieter Siebert might be identical with 20th-century classical music composer Wilhelm Dieter Siebert (1931-2011). His Wiki-resume mentions that he played Jazz in the late 50s. – I further assume that Volkmar Schmidt is saxophonist, clarinetist and orchestra leader of East-German groups Gruppe Schmidt, Schulz & Co., Orchester Volkmar Schmidt and Volkmar Schmidt Combo. – Drummer Kurt Giese later became a producer for North German radio (NDR) and arranged Chet Baker´s “Last Great Concert” in 1988 in Hannover, two weeks before Baker´s death. – Trumpet solo on Franz Grothe´s Mitternachts-Blues by Karl Wolfgang “Charley” Wiesenthal. These four tracks, exclusively recorded by Opera – Europäischer Phonoclub, have not been reissued in 50 years. Yah-dah! 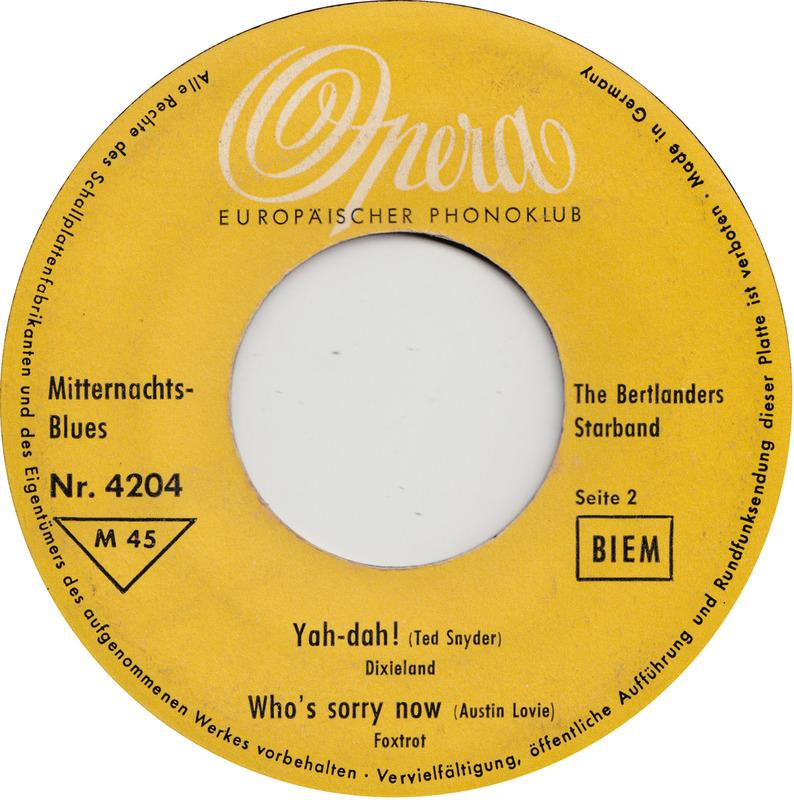 is a nicely up-dated version of one of the earliest Jazz recordings,Yah-de-dah, first recorded in 1917 by the Frisco Jass Band. Funny! I posted an amateur Jazz sampler from 1958 a few days ago. And the Bertlanders were part of the line-up. Thanks a lot for the music and the scans! And the information! 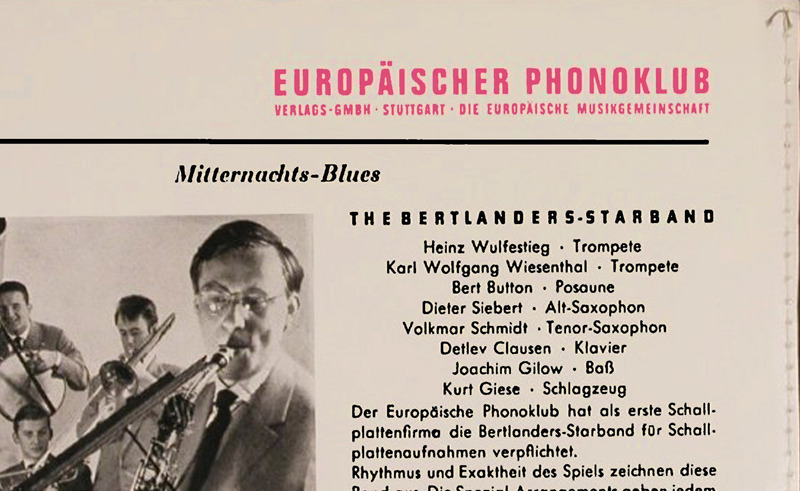 It still seems odd to me though, that the Bertlanders were an amateur jazz band from Berlin, while Bert Landers and his orchestra were a studio group. 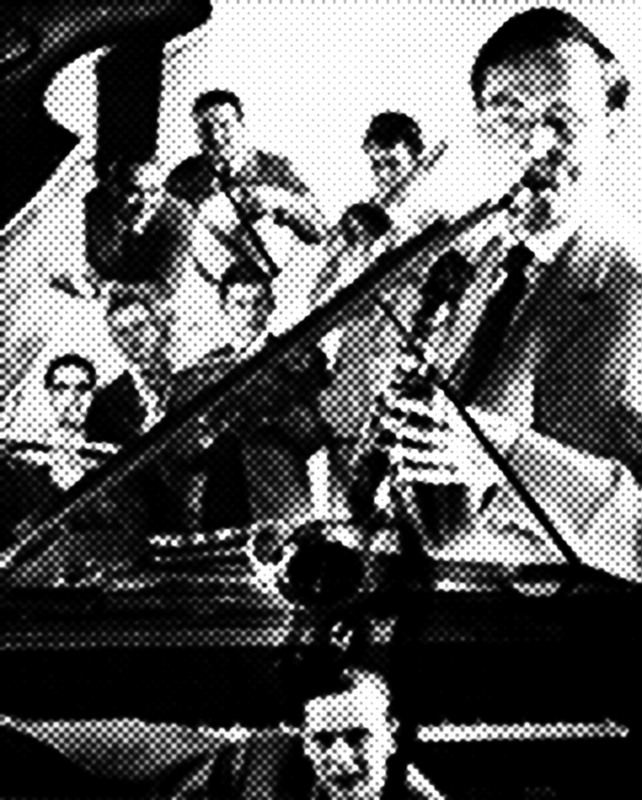 Maybe it´s because, as Joachim E. Berendt writes in the liner notes of “Amateur-Jazz-Festival ´58”, the Bertlanders “accentuated arrangement and composition”. Their clarinetist and alto-saxophonist Dieter Siebert was voted best arranger of the festival. High technical abilities often lead musicians from amateur to a more commercial work. But of course, the biggest question still remains: Who was Bert Landers? 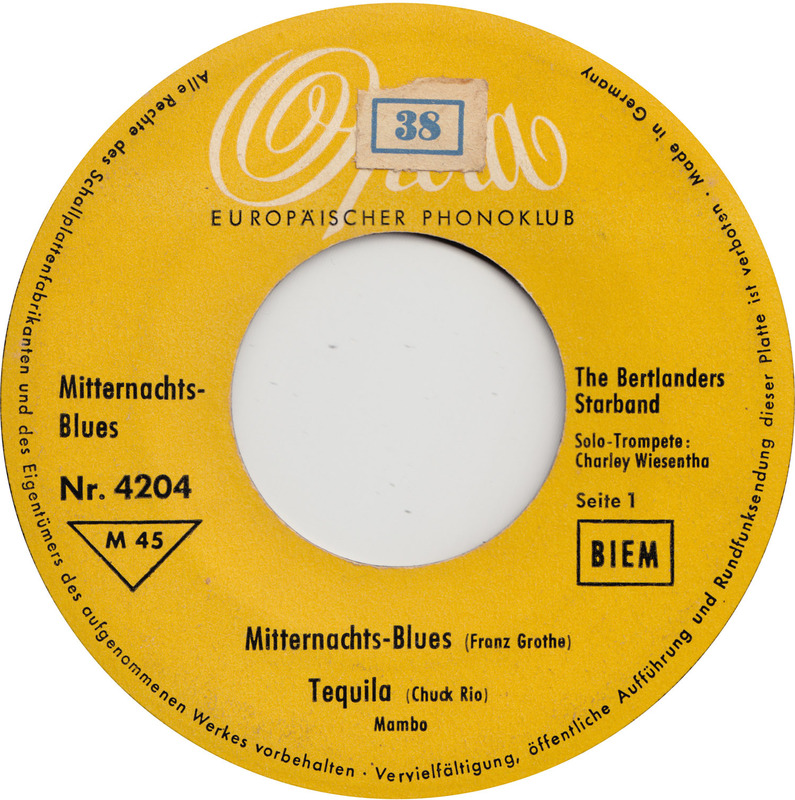 I found your site because I was looking for “The Bertlanders”, an amateur band I saw and heard at a fasching night somewhere between 1957 and 1959 at the Technical University of Berlin where I was studying at this time. As I heard, the name of the band was a combination of the leader’s name Dieter Siebert and “Lullaby of Birdland”. Dieter Siebert was at that time studying clarinet at the music high school in Berlin and has been a professional musician later on. Thank you very much for this nice remembrance!